How about this kid, he got some skills! Nice clean "crisp" of each cyl hitting in a small block , nice. Couldn't wait to go to the track and open the headders. Now I go for things like the intro to this .....of course the rest of the song is pretty good as well . Me and the Chevelle just like to take a lazy ride every now and then. "Slow down Joe, I'm a rock and roll man" - Elton John....Holiday Inn. Not only did I have a CD player, a Cassette Player, an 8track Player.. But I also had a 45 Record Player..yes you tennie boppers, a 45 RPM player by RCA. I had it put in my Chrysler 300F at the dealership here in Ohio. It had a custom bracket that hung from the underneath of the dash board and pulled out to load and play and it was automatic..
and here is an image! Click It ! 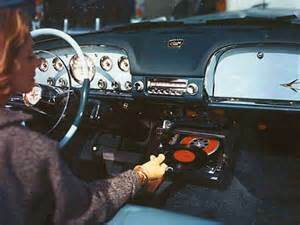 gotta love a record player in a car! 7 year old as a designated driver?